Out on a trip to try a sword drop. First 8-10 miles not too bad then it got rough. With seas to nasty to drift we look for weeds or birds in about 1000’. Got one diving on the water so I turn the boat and set a troll towards the frigate. By the time we got the spread out the bird was gone. We continue to troll on the same path even though there is no weeds. It doesn’t take long and we have a hook up. With one on then we see the bull with her. I grab a pitch rod and a pilchard and he piles on it. After a good battle and some tricky gaff work we get them both in the boat. That was a good start but with no weeds or birds we move on to look for something more fishy. Make it about 5 miles to the east and see some small birds so we drop back the feathers. Not much weeds but a little rip and it produces a couple of BFTs. Now we are close enough to the humps that we steer that direction and get 2 more BFTs on the troll. Couple more circuits produce another BFT and then get sharked up. Decide to try drifting a couple pilchards and the first one gets hammered but pulls the hook. Next time as we head west to set up we see a nice weedline forming. 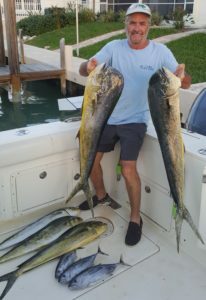 Get the spread out and bam mahi on. Getting close to the boat see a friend so I pitch out a bait and get hooked up. These are two more nice sized dolphins. As we work to get the first one in the second pulls the hook. We have 5 tunas and 3 phins in the box. Time to look for more while heading back inshore. On the way in we come across floating rope and it was 5-6” in diameter. 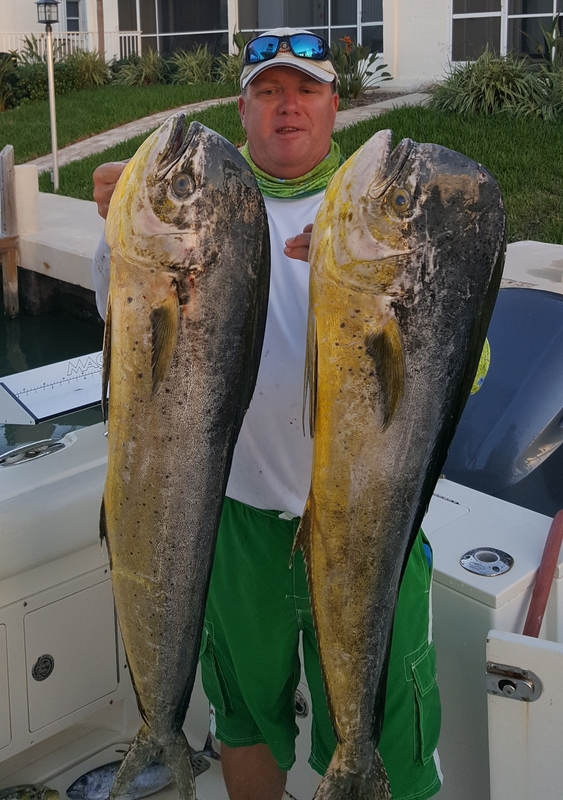 We drift around and see lots of jacks and undersized triple tail. Mess with them for a while and then decide to pull the rope in. After we get the rope in Lance sees flash and throws a bucktail at it. Hooked up it was an acrobatic Mahi that put on a great show. She had friends there so we threw out some pilchards and hooked up three more. Got a total of three more in the boat and maybe the biggest of the day got off. 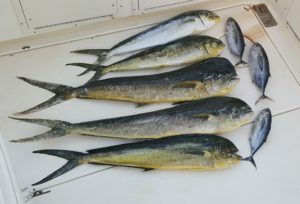 Was a good day under rough conditions and plenty of meat in the box. Had a couple miss the picture but ended with 6 mahi and 5 BFT. Couple almost slammers and rest gaffers.